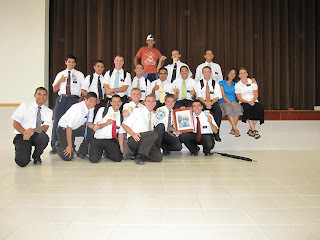 Well, Elder Clark was transferred last week!! He is headed to a new area called, Paratibe. The only information that we have is that he and his new companion are both new to the area and that the weather will be much hotter(he is closer to the coast). We will surely get more information in this weeks letter as he will have a week under his belt. He was looking forward to meeting new people and I am sure there are those in this new area that are waiting for Chris to knock on their door. 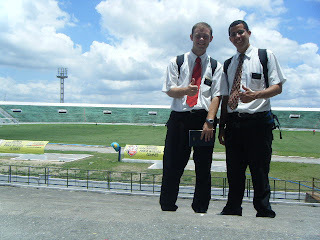 While Chris was in Joao Pessoa for transfers, he and Elder L.Santos were able to go inside the big Soccer stadium there. 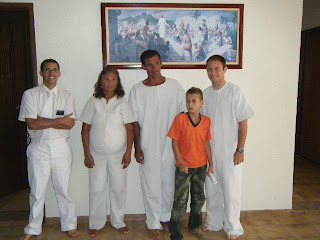 Before Elder Clark left for his new area, he had the opportunity to baptize Maria Germana 83 and Italo (her son) 33. Chris was very excited as this is the first man that he has baptised. There are also others in that family that are looking forward to baptism and that is one of the things that made it hard for Chris to leave that area. These Elders really get attached to the people they are serving and teaching. I know he will continue to pray for the people of Jardim Palistano as he learns to love the people of Paratibe. Wow. That stadium is beyond huge!! It's ginormous! It will be interesting to hear what he thinks about his new area. Keep it cool, Chris!